I’m going to predict that most people will feel similarly about this book as they would have about Insurgent by Veronica Roth, because it dives really deeply into the psychology of the characters. It also very accurately depicts they way people would genuinely behave after suffering major trauma.These types of stories aren’t always the most “fun” to read, because they’re very raw, and real, and even uncomfortable at times. That said, I love that type of story, and I LOVED this book. My advice to my fellow book devourers would be to go into this looking for the psychological and sociological elements that make these characters authentic and to also observe how perfectly Victoria Aveyard handled the political tension and world-building here. I think it’s absolutely brilliant, and if you don’t go into it expecting fluff and lots of good feels, then you’ll really enjoy it as well. 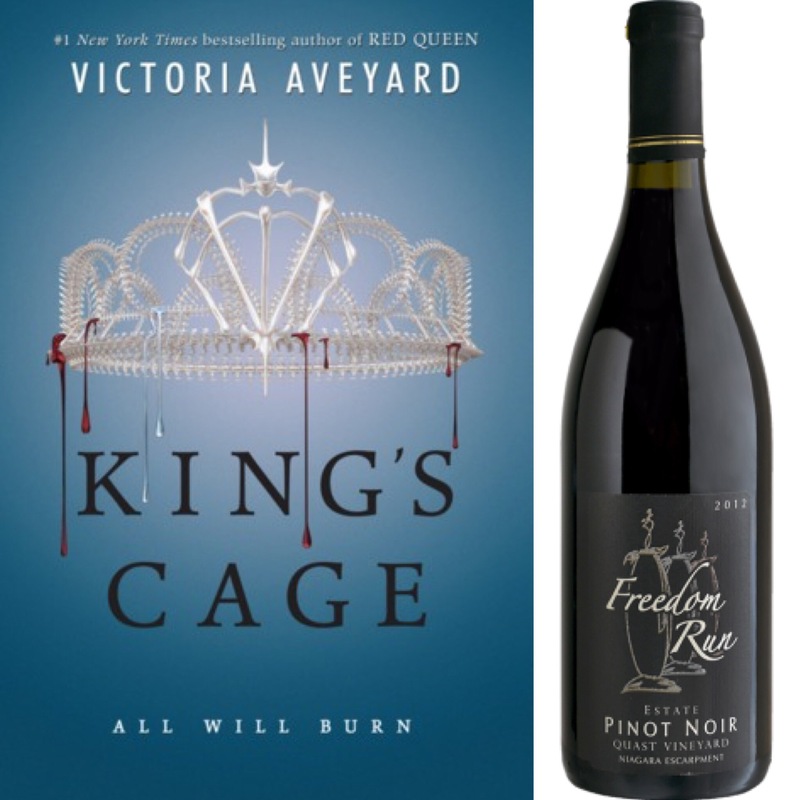 Sip on this Freedom Run Pinot Noir while immersing yourself in the tale of Mare Barrow and the Scarlet Guard’s battle for freedom in this latest installment in Victoria Aveyard’s Red Queen series. I really, REALLY loved this book. I cannot say enough what a brilliant job Aveyard did here with delving into the psyches of her characters. They’ve been through some extremely traumatic situations and it shows. Aveyard does not pull any punches. She doesn’t gloss over anything. She perfectly depicts how the characters would truly feel in these situations, and she makes you really feel right along with them. My FAVORITE part of this book was getting to delve further into Maven’s character, why he is the way he is, and really getting to see how complex his feelings are for Mare. I can’t say that I like him more after reading this, but I definitely understand him more, and think that he truly is a perfectly crafted villain. This book jumps around in POVs a bit, which is really fun. We get to read from Mare, Cameron, and even Evangeline’s perspectives. While reading through Mare’s eyes can be tough during the parts of this book where she’s being held captive, I feel that Aveyard did a great job of accurately displaying Mare’s emotions, not just from being in held prisoner, but also the grief she’s suffering after losing Shade. An ever brighter light is shone on Cal’s character flaws in this book. While he’s still incredibly likable, and let’s be real, totally swoon-worthy, I loved having those flaws be so prominent. It makes him a much more complex character, and I like my characters complicated. Aveyard absolutely knocked the character development out of the freaking ballpark in this book. I don’t want to give any spoilers away, so I’m not going to get into any specifics, but I LOVE it when an author can make me hate a character in one book of a series and then make me ADORE them in a later book. That definitely happened for me in this book, and I can’t wait to see more of this character in the next installment. I will admit that the pacing of the plot can feel a bit slow at times. While there are certainly some FANTASTIC action scenes (one in particular had me practically pacing in my cubie), there isn’t as much action in this book as there has been in the previous books. BUT that’s because this book is really more about the characters and their development in my opinion. And it’s just SO. GOOD. There are some majorly important things that are accomplished in this book, but Mare and crew certainly have a long way to go before this tale is over. I am so glad they extended this series into a four-book series, because I really enjoyed all the detail we were given in this book that certainly would have been glossed right over if that decision hadn’t been made. So in summary I LOVED this book. I highly, HIGHLY recommend this book but encourage you to read closely. I think a close read is necessary for this type of book in order for readers to enjoy it, and if you put that extra thought and effort into it, it will more than pay off. The covers for all of these books are just beautiful. I love the crowns, and how they symbolize the struggle for power in this world, and I love how on this cover we get the dripping red and silver blood. There’s been more and more silver blood on the covers, which seems representative of the ground that the Red Bloods/Scarlet Guard/New Bloods are gaining. I love how when you stack the three books they have some beautiful fade action going on. And the end pages are INCREDIBLE. Overall, I wouldn’t necessarily label this as a swoony read. However, there is one hot, hot, hot scene that earns this book a four-star swoon rating. Mare’s feelings for Maven and Cal are still incredibly complex and seem to become increasingly complicated as their characters continue to become more and more defined for her. This doesn’t at all feel like a tropey love triangle. It isn’t as if Mare is trying to choose between the two. It’s just that she has very real, very tangled feelings about both of them. I’m a writer repped by Suzie Townsend at New Leaf Literary & Media, Inc. I split my time between my hometown East Longmeadow, Massachusetts and Los Angeles. After graduating with a BFA in Screenwriting from the University of Southern California, I decided to try my hand at writing a novel. My debut RED QUEEN came out of the terrifying, unemployed year after college. The sequel GLASS SWORD released in February 2016. Currently I’m working on the third book in the RED QUEEN series, along with pursuing other projects in literature and film. My proudest achievements are riding a horse in the mountains of Montana and navigating from London to Edinburgh without GPS. You can find my BLOG at www.victoriaaveyard.blogspot.com if you’re interested in some longer ramblings. Follow me on TWITTER @victoriaaveyard for 140 character ramblings. And check me out on FACEBOOK for info, events, and other fun stuff! 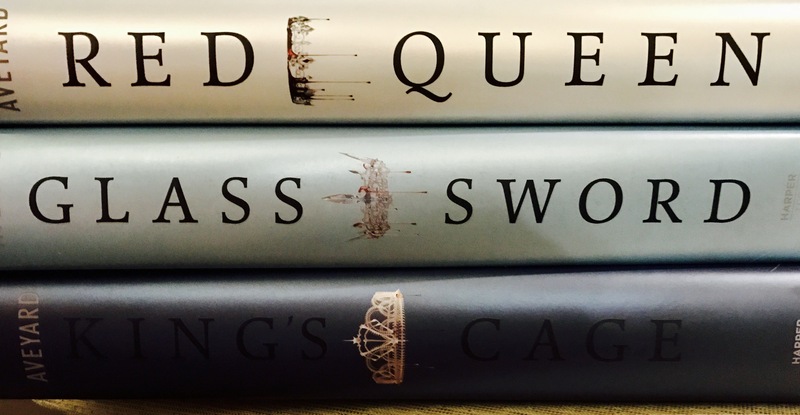 Have any of you finished King’s Cage yet? Let’s chat all about it in the comments below! I’m so jealous! Mine hasn’t arrived yet even though I pre-ordered it. Why do I have to live so far away? T___T Gosh! Your review made me so excited! Aaaargh. I am definitely going to look out for that “one hot, hot, hot scene”! Hahaha. Ah, that’s the worst! Hahaha, yes the HOT scene. You can’t miss it. 😁 So I’ve always been team Cal, I think I still am. Mostly I’m team Mare though, and cannot wait to see how she ends the romance part of this. KILLING me! Haha. Gosh! I am really, really excited right now. ❤ I hope Mare chooses wisely. If she doesn't choose Cal, I'm gonna keep him for myself. Hahaha. Okay, you officially have to let me know when you read this, because we’re gonna have to fangirl a bit. You can check this link for the details. Oh, my gosh I totally didn’t see that! That was really awesome of you. Thank you so much! Checking it out now! I can’t wait for you to read it, so we can chat about it. I’m dying to know what other people (whose opinions I trust) thought right now. I’m so not surprised. I was guessing there’d be a lot of people that didn’t love it, because it’s so raw. It’s not a “fun” read. But I LOVED it. I hope you like it! Let me know what you think!!! Great review. Now on my ever growing TBR list and love that you combine books and wine – heaven! I loved your review. I started reading Glass Sword last month, but had to put it down. Mare was just grating on my nerves for some reason. I’m hoping to pick it back up and try again sometime soon because I’ve heard such great things about King’s Cage so far! I actually really liked Glass Sword, but Mare’s POV can be hard to read through sometimes, because she goes through so much emotional turmoil, and Aveyard definitely makes you feel that, which isn’t always fun to read. I hope you like the conclusion of that one and this new book as well! Omg!!!! Your review makes me want to read this even more!!! I pre-ordered it but I’m reading Heartless right now and I know if I start King’s Cage I’ll never finish Heartless lol. I am so glad you feel the characters are developing more because I am so into all of them and have been dying to learn more about each of them!!! OMG I’M SO EXCITED!!!!!!! I’m about half way through Heartless. I am def writing a review when I am done! UWAH, I just finished it last night, and it was SO GOOD! I loved it. 🙂 There’s just so many things to talk about haha, I can’t focus on any of it because there’s just SO MUCH! You are right in everything you said in your review, I agree with it all. I’m so glad you love it! I did too. It was so mind-blowing to see how the characters are developing and see some more into Maven and his story. It was just SO GOOD! It was so great to read all the Maven parts! I was always fascinated with what he was saying, I was always on the edge in all of their conversations. It’s like, I want to hate him, but I just can’t! I’m actually more Team Maven then Team Cal. I find him absolutely fascinating, and they’re both so flawed in different ways. I think I just love to hate him so much! It’s so true. I love them both, but if Mare ends up with one of them, I’m kind of Team Maven now. Part of me hopes she doesn’t end up with either though. And the rest of us can all just fangirl over these awesomely complex book boyfriends forever. I LOVE this theory more than words! And I LOVE words. Hahaha! Agreed. I think you’ve just come up with the perfect fan fic! Great review! I couldn’t agree more. I adored this book, and I LOVE Maven’s character, especially now. He’s so fascinating. I could read about him and his backstory forever. I would definitely support that novella! I still need to read Glass Sword!! Ahh!